Manchester City have picked up where they left off in the Premier League this season, blowing away all in their path and leading the early standings, as meaningless as they might be to Pep Guardiola right now. Although he won't say it in public, one man who will be quietly pleased with the way things have started is Watford head coach Javi Gracia. Gracia has also led his side to maximum points against Brighton and Burnley so far - and has a chance to make it a hat-trick of wins against Crystal Palace on Sunday, live on Sky Sports Premier League from 12.30pm. It's nothing more than Huddersfield, who went on to contest a draining relegation battle, managed last season; but like the Terriers, most have included Watford in their picks for the drop this time around. The Hornets are already in credit by five points compared to the same two fixtures last season. 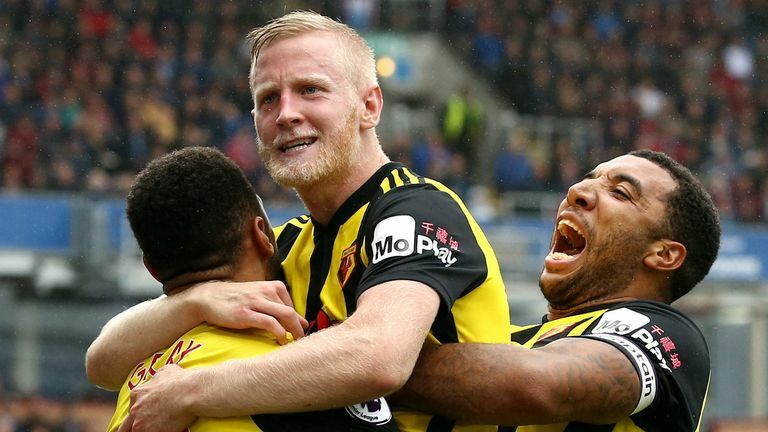 Watford's best start to a top-flight season since 1982 owes much to their improvements at both ends, despite starting both games with Ben Foster as their only new addition, and having gone through a mediocre summer with relatively little reinforcement in attacking areas. But there has long been an anticipation that a partnership of the club's two best strikers, Andre Gray and Troy Deeney, could help bring back the results that dried up for much of the second half of last season. Gracia has reached the conclusion that 4-4-2 suits the Hornets best right now, and that has not come from anywhere other than his own coaching staff. Both Deeney and Gray struggled last season, scoring 10 league goals between them and three of those from the penalty spot. But they are already off the mark for this campaign, and there were signs of a blossoming relationship at Burnley as Deeney set up his strike partner for the opener inside three minutes of their 3-1 win. Deeney appears revitalised. Watford's regular top marksman had only 14 shots on target last season, but two games in, he's already got four this time around. The stats show he is winning fewer aerial duels, but more shots, more dribbles and more involvement in the game as a whole is a direct result of the licence to drop deeper alongside Gray. Gray was left to lead the line on his own for much of last season when chosen ahead of Deeney, and although playing on the shoulder is perfect for the former Burnley man, holding the ball up is not. He often drifted in and out of games as a result. Gray has been left to do what he does best, and his touches in the opposition box have increased by more than half so far this season, and his shot count has done likewise, while making significantly fewer passes as he leaves others to build-up to chances. At the other end of the pitch, Watford have struggled with injuries for longer than they would have liked, having to turn to back-up defender Adrian Mariappa for 28 Premier League games last season, even though the 31-year-old was arguably fifth choice at Vicarage Road. Craig Cathcart has returned to fill that gap after missing most of last season with a number of niggling problems, playing just 495 minutes in 2017/18 but already helping the Hornets concede just the solitary goal from their two games so far. This is where their defensive improvements confound the statistics; Watford's attacking quality has been clear, creating double the number of clear-cut chances they did per game last year, and racking up more shots, completing more crosses and touches in the opposing box. However, they have won a smaller proportion of their duels, even fewer of their aerial challenges, had less possession, and completed around 20 fewer passes per game than they did last season. In fact, they were only worse at managing to find a team-mate twice in 2017/18 than in their win at Turf Moor on Sunday - but their defensive organisation as a unit shone through and they were relatively comfortable in picking up a first away win since November. Injury to Gray or Deeney would leave Watford back to square one, with Stefano Okaka injured and the club's only other senior striker, Jerome Sinclair, on loan at Sunderland in League One. But if both can stay fit, as well as the back-to-form Cathcart, that meticulous attention to detail which won Gracia so many plaudits with Malaga and Almeria could help them continue their bright start against Palace on Sunday.